Packaged in 4-panel Digipak with 28-page full-colour booklet. 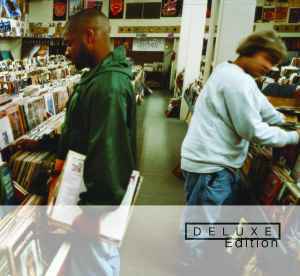 First disc is the original version of Endtroducing... (originally released on Mo Wax in 1996). Second disc titled "Excessive Ephemera" includes demo versions, alternate takes, remixes and b-sides. Recorded at The Glue Factory, San Francisco. Track 1-2 contains a sample of "I Feel A New Shadow", as performed by Jeremy Storch, written by Jeremy Storch. Track 1-3 contains a sample of "Orion". Track 1-4.1 contains a sample of "Invisible Limits" by Tangerine Dream. Track 1-5 contains a sample of "The Vision And The Voice Part One - The Vision (Ray Smith)", as performed by Flying Island, written by Flying Island. Track 1-7.2 contains a sample of "Love Suite", as performed by Nirvana (2). Track 1-8 contains a sample of "Possibly Maybe", as performed by Björk. Track 1-11 contains a sample of "The Madness Subsides", as performed by Pekka Pohjola, written by Pekka Pohjola. Also contains a sample of "Sower Of Seeds", as performed by Baraka (10), written by Baraka. Track 1-13.1 contains a sample of "The Voice Of The Saxophone" from "Afro American Suite Of Evolution", as performed by In Motion, written by J. Heath.